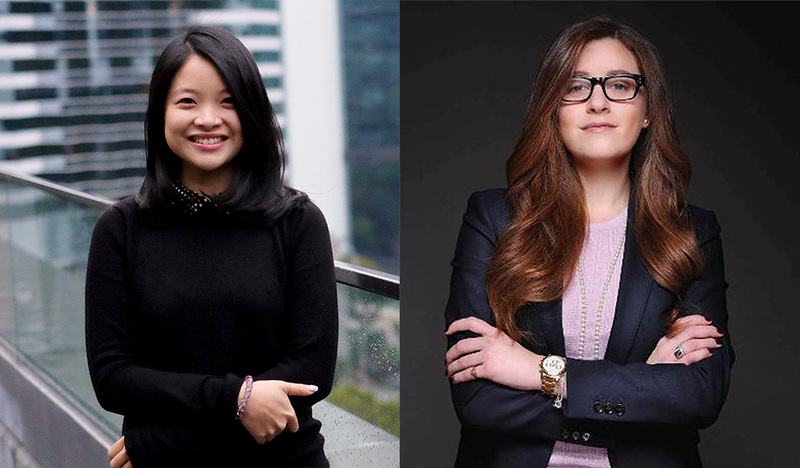 Forbes Magazine has named Lauren Hurwitz '08 and Jenny Lee '09 to its new "30 Under 30 Europe Finance" and "30 Under 30 Asia Finance and Venture Capital" lists, respectively. The two women are the latest Wellesley alumnae honored by the publication for achievements in business and finance. Both said that lessons they learned at Wellesley helped prepare them to shape the future of their companies and the future of finance in their region. Hurwitz, a business manager based in London, majored in economics. Two classes she took with Joseph P. Joyce, M. Margaret Ball Professor of International Relations and professor of economics, influenced her career path, including her decision to earn a master's of science in finance at the London School of Economics, she said. "His classes enabled me to deeply understand the ties between the financial sector and the broader economy," she said. "I wanted to be at the nexus where private markets and macroeconomics intersected—and that’s what I pursued." Hurwitz also worked with Joyce on her senior thesis, which focused on the Basel Accords, a set of agreements set by the Basel Committee on Bank Supervision that provide recommendations on banking regulations to ensure that financial institutions have enough capital on account to meet obligations and absorb unexpected losses. The insights she developed from that research helped her excel in her first job, with Merrill Lynch in London. She started the day Bank of America acquired Merrill Lynch, in what would become one of the largest mergers of financial institutions. "I was fortunate to land on the transition team, where I spent two years learning about change management and operational strategy," she said. "I then spent three years in the mergers and acquisitions division, covering banks and insurance companies. These years coincided with massive regulatory change in Europe, so I spent a considerable amount of time helping clients understand how the new Basel accords would impact them both financially and operationally. I put my senior thesis to work here." Hurwitz has spent the past two and a half years at Moelis & Company, where she heads the Europe, Middle East, and Asia operations and is involved in all aspects of the organization, from its financial and operational efficiency, to designing its culture, to writing new policies, managing talent, and leading their Women's Leadership Forum. Lessons she learned at Wellesley have been key to her success so far, she said. "I learned to trust the journey, even when the destination is unclear and to take risks—real, actual risks. The single most important gem of knowledge I took with me was a genuine belief that just because something hadn't been done before, doesn't mean it couldn't be done," she said. "Wellesley also taught me that it’s OK to be a force. Not everyone will like you for it, but it’s necessary if you’re going to be an agent of change." Jenny Lee, who grew up in Taipei, Taiwan, majored in economics and East Asian studies at Wellesley. After graduating in 2009, she moved to New York City to join Deutsche Bank as an investment banking analyst working on healthcare deals. Two years later, she transferred to the Hong Kong office where she was able to gain more client exposure and worked with the management team of private companies across various industries. Those interactions helped her realize that she didn't want to build financial models in Excel all day, but build businesses instead. In 2014, she joined WeLab, a small financial technology startup that had big aspirations for changing the lending landscape in China and Hong Kong. She helped build the company from the ground up, and today she is head of growth, scaling the business in order to provide affordable credit to the consumer credit market and working with institutional investors to raise lending capital. Lee said that everything about her Wellesley education—the curriculum, the professors, and the classroom setting—prepared her for career success. "Being able to go from solving proof equations in a logic course, to analyzing the differences between bebop and swing music in a jazz music course, to writing a paper on The Tale of Genji for a Japanese literature course, and then discussing the impact of the Great Depression on current monetary policy in an economic history class, all in one day, is the quintessential well-rounded Wellesley experience," she said. "The campus environment encouraged me to be interested in a lot of different things and challenged and trained me to think critically about a wide variety of topics. I think this is why I have been fairly industry-agnostic in my career and have been able to take on new and differing roles where I had to learn the ropes quickly." Lee also said the worldwide Wellesley network has helped her get where she is today. "I wouldn't have attended Wellesley if it weren’t for the alumna in my hometown who shared her college stories with me," she said. "Likewise, I wouldn't have been able to get my foot in the door at an investment bank straight out of college if it weren’t for the supportive group of alumnae already working on Wall Street who provided me professional advice and helped me transition to the 'real' world." After Lee left banking, one of her best friends from Wellesley introduced her to another alumna who was already working at WeLab and offered her the rare opportunity to join the company in its early stages. "One of the most important lessons I learned at Wellesley is to be open-minded and value diversity," she said. "I try not to shy away from new experiences or challenges and often seek new learning opportunities. This mindset is what brought me to WeLab."